*Words from the Heart *is a moving story of lost love letters, fragile fears, and the beauty of taking another step forward. Words from the Heart by Kathleen Fuller is the third An Amish Letters Novel. Ivy Yoder has not heard from John King in a year. She received one letter from him written right after she returned home. He broke his promise and her heart. Ivy must now move forward with her life and needs a something to occupy her mind. Ivy arrives home from visiting with friends to find Noah Schlabach on her doorstep. Noah is an auctioneer and antique specialist. His great aunt, Cevilla Schlabach has asked that Noah and Ivy clean out her attic. She insists that they do it together. Noah knows Cevilla is up to something, but he is eager to see what is in the boxes. You never know what treasure they will find. The pair slowly go through the boxes and get to know each other during the sorting process (finding numerous doilies and old magazines). One of the last boxes they explore contains some damaged doilies and a packet of letters written during the Korean War. Noah and Ivy get drawn into the story of two people (Bunny and CJ) in love. Ivy develops feelings for Noah, but she is afraid of getting her heart broken again. Noah used to be satisfied with his work, but now he feels that something is missing. Cevilla is certain that Noah and Ivy are meant for each other. She has arranged for them to spend time together, but the rest is up to these two very stubborn individuals. Will they learn from the past and embrace life? Can Ivy move forward and find love with Noah? Will Noah give up his roaming way to settle down in Birch Creek? Words from the Heart is a touching romantic story and my favorite book in this series. I find it refreshing to read stories that have little to no violence, intimate scenes (just kissing), and no foul language. I found the book to contain good writing and a nice flow which made Words from the Heart was easy to read and enjoy. 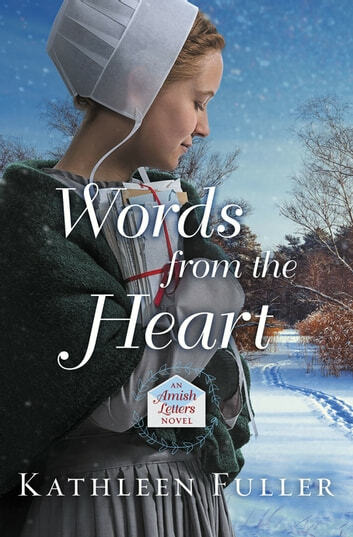 Words From the Heart can be read alone, but I suggest reading all the book in An Amish Letters series. It will familiarize you with the characters from the previous books which are present in Words from the Heart. I appreciate the author updating readers on what has happened to the people from Written in Love and The Promise of a Letter. I like the characters in this story especially Cevilla Schlabach. She is a delightful older woman that is happy with her life and the choices she has made (spunky, quirky). Many of her scenes have me smiling and chuckling (especially when she decides to attend the school board meeting of which she is not a member). The author provides the right amount of background and detail on the main characters along with supporting cast. Ms. Fuller even brought CJ, one of the letter writers, alive with her words. The Christian elements are present throughout and it enhances the story. Prayer, forgiveness, trusting God and faith are a few of the Christian themes in the book. While the romance element is predictable, it is sweet and heartfelt. It was lovely to watch their (Noah and Ivy) feelings grow for each other over the course of the book (while they each tried to resist). The additional elements that Kathleen Fuller added to the story gave it depth and complexity (upcycling, items they found in the boxes, Noah’s symptoms for example). These items made for a richer story. Reading Words from the Heart is a satisfying way to idle away a Saturday afternoon.